PHILADELPHIA (WPVI) -- Keeping warm seems to be an obsession across the Delaware and Lehigh Valleys, as the deep freeze goes on, with no end near. Although people seem to coping well for now, refreshing our knowledge on cold weather tips never hurts. The National Institute of Occupational Safety and Health focuses on the care of workers-on-the-job, however, their advice also rings true even if you're not working in the cold. * Remember to dress in multiple layers - more lighter layers insulates better than 2 heavy ones. And keep the clothes loose, to trap more air around your body. Tight clothing (skinny jeans or leggings) restricts blood circulation. * Fiber can make a difference. Cotton can make you cold if it becomes damp from perspiration. It absorbs moisture, rather than wicking it away from body. For a base layer, consider polyproylene. Athletes swear by it, because it does wick moisture away. Wool's fibers are curly, so they trap more heat close to your body. * Protect your ears, face, hands, and feet ALL the time you are out. Even a few minutes of exposure can damage skin. And slap a hat on indoors, especially if your home is drafty, you are elderly or very young - uncovered heads lose a lot of heat, indoors or out. In the short run, frostbite is the big danger. However, as the cold goes on, hypothermia - abnormally low body temperature - is a bigger risk. Your body begins to lose heat faster than it can be produced. A body temperature that is too low affects the brain, so the victim may not even know it's happening. 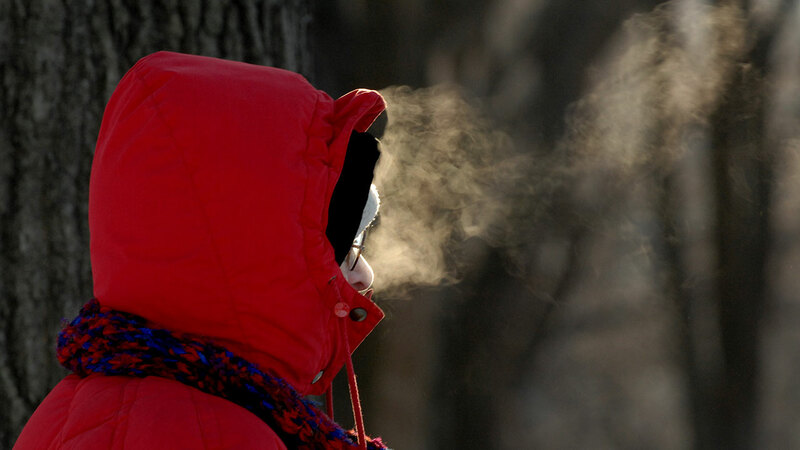 If someone develops hypothermia, warm the center of their body first - chest, neck, head, and groin. For frostbite, use warm, not hot water, to warm the affected area. The Red Cross says to reduce the risk of hypothermia - and to keep pipes from freezing - keep your thermostat at same temperature day and night. 1. Warm yourself first. Instead of turning up the heat, put on another layer of clothing. 2. Turn on the ceiling fan. Warm air rises, so run your fan on its lowest setting in a clockwise direction to push the warm air back down. 3. Trick a locked thermostat. If you don't have access to change your thermostat, outsmart the device by making it "think" the room is colder by putting ice near it. 3. Stack you bed covers right - Fluffy blankets closer to your skin, and thin, dense blankets on top to prevent convective heat loss. 4. Don't put your bed directly against an exterior wall. You'll be warmer if you leave a little space.